I love puff pastry. It reminds me of my grandmother’s kitchen. 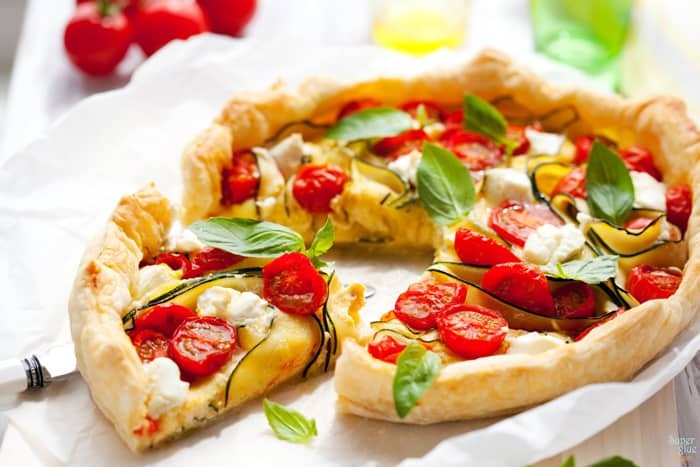 She loved to make all sorts of easy puff pastry tarts or quiches for dinner. When you see how easy it is to make this quiche recipe, you’ll want to make it over and over again. There are days where I don’t want to make intricate meals. It’s mid afternoon and it’s too late to throw something in the crockpot. I want something quick, easy and delicious my whole family will love. When I say quick, I mean fifteen minutes or less of prep-time and the oven or stove can do the rest. For this, I usually hit the freezer and pull out frozen pie dough or puff pastry. I decided to use what I had left of my cherry tomatoes, mozzarella balls and one zuchinni. The zucchini looks all pretty, don’t you think? Ha! it’s not because I have fine knife skills, this technique is the result of using a vegetable peeler while balancing a baby on my hip. Speaking of that baby… I can’t believe he is sixteen months old already! Time flies. My girl is turning 7 in a week. What is happening here?! Why can’t we pause time? I’m sure you can relate to this if you have kids of your own. It seems like it was yesterday when I launched MOMables and had a baby. My goodness! This week has been filled with excitement and activity. I can’t wait to tell you more details… very soon. I promise. For now, know that I am cooking up some great stuff… little things here and there that lead to a really big thing. Where were we? Oh yes. This awesome puff pastry quiche. It’s a no frills recipe. The ingredients are easy to swap for what you have on hand. Say… ham and cheese only? Bacon and cheese? 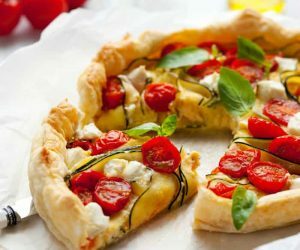 Tomato, basil and mozzarella? Done and done. Just because the pictures look pretty, doesn’t mean it’s too pretty to eat. Most of my blog pictures are taken outside, when dad is home and the kids are entertained. Today, I was alone. I used a lighting kit by a window and leftover props from a previous shoot. It was too cute to go to waste, right? Next week, I’ll tell you about my trip to Virginia a few days ago. I had such an amazing time and got to meet other foodies who love hummus as much as I do! For now, I leave you with my new favorite way to eat eggs. I’m sure you are going to love it too. 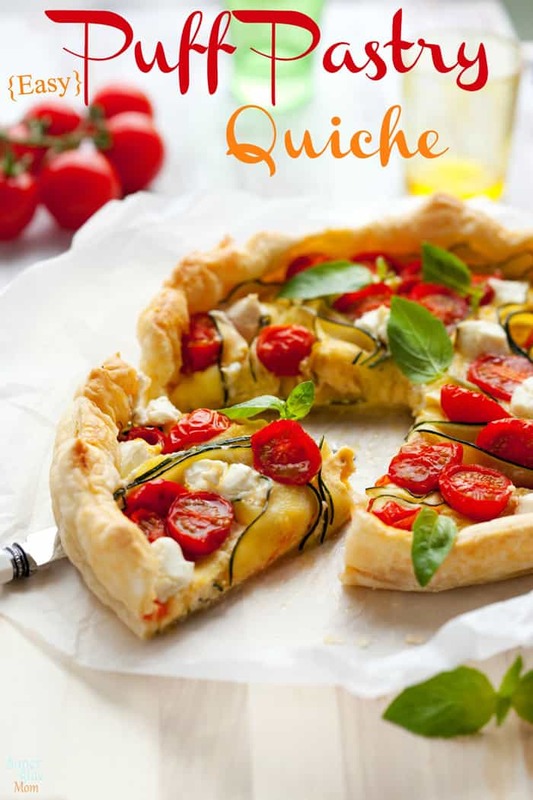 Classic quiche texture with a surprisingly delicious crust. Unfold pastry sheet on to a pie dish. If you want it to have nice edges, go around and cut the excess puff pastry all the way around, leaving 1/4 inch over lap. You can also lay it flat on a baking sheet and create a rectangular quiche. 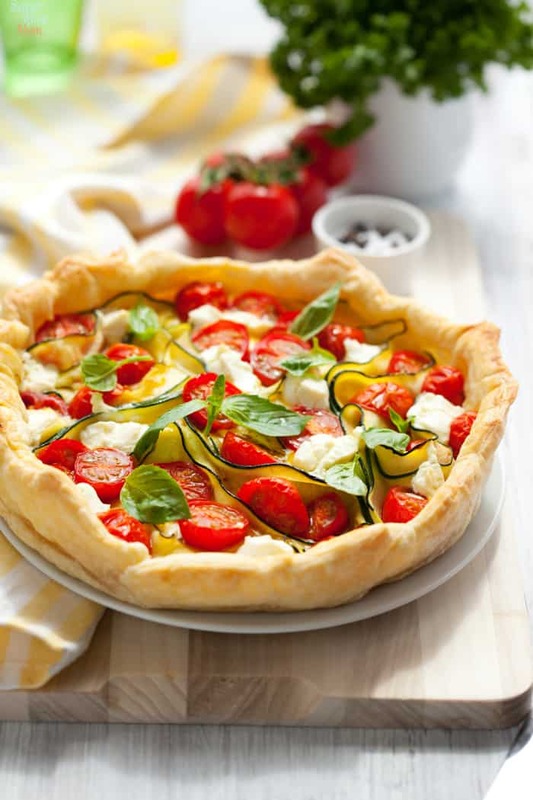 Top with tomatoes, zucchini and cheese. Whisk eggs, rosemary, pepper and salt in a bowl. Whisk in yogurt or sour cream. Pour egg mixture over toppings over puff pastry. Bake until pastries are puffed and golden and toppings are set, about 18-22 minutes. This recipe is very simple and versatile. Swap ingredients and have fun! If your edges are beginning to brown and your quiche is still jiggly, cover the edges with foil until it’s fully cooked and firm. Nobody likes jiggly eggs, right?